Maybe I spoke too soon yesterday when I suggested the cloud storage dream was dead. Today comes news of a new online service that offers essentially unlimited cloud storage, for free, without any need to register or pay-up. Unregistered users can even upload several files at the same time. Unlike similar free cloud storage services such as Rapidshare or Megadownload, there's no wait for downloads. Simply click the link, and it'll start straight away. While you can use the site without registering, creating a free account brings with it the ability to password protect files, and set release dates for files, before which they'll be inaccessible. Additionally, users are able to organize their files in 10GB of free storage space. Paying for monthly, half-yearly or yearly membership brings double the file-size limit (2GB), and up to 1000GB of space. Additionally, files won't expire after three months, as with the free accounts. Once you upload files, you can share a download link with others, or click another link to instantly delete the file. Outside of membership fees, which I suspect will be few and far between, it's not clear how Baltsoft expects to make money from the service. Until now the company was best-known for its Website that converts office documents and images to PDFs. In other words, it's hardly a giant in the software world and is in all likelihood using Amazon's S3 storage as a backend. That might prove expensive when the tiny fees for uploads and downloads start to add up. The service will also undoubtedly attract the wrong kind of Internet customers--those who like to share files of dubious origin without any fuss. It's not clear what methods, if any, are in place to stop copyright abuse, aside from an e-mail address provide at the bottom of the page. Similar storage service Rapidshare recently hit back at critics that claimed its service was used for little more than the redistribution of pirated files, pointing out that it's a legitimate company used by many consumers and businesses for the backing-up and sharing of files. However, piracy issues shouldn't overshadow what could become one of the most useful online services for sharing large files with others, or even for backing up personal data. 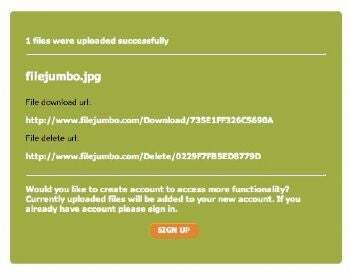 Rather than e-mailing everybody that funny video, or photos from your vacation, just upload them to FileJumbo and send them the link. There's not even any need to worry about deleting the flle because three months after the last download it'll automatically be removed.